We stood next to the dining room table, a 1920’s Art Deco antique passed down from my great-grandmother Nanny. Decades-old scratches laced its corners but a fresh coat of furniture polish and a sprinkling of orange and brown Thanksgiving-themed decor, carefully placed earlier before they arrived, brought it into modern festivity. “How many meals have been eaten at this table over the generations?” my dad observed with a hint of nostalgia as he scanned the room, his grey-white hair neatly combed and a crisp flannel button-up clothing his smallish frame. I eyed the antique buffet cupboard next to the table. “I thought about taking all that stuff off and putting the desserts on top,” I replied. It was strategically covered with recipe books and photographs and trinkets and candles. It was always covered with coconut pies and chocolate cakes during holidays at Nanny’s house. This Thanksgiving it was just the four of us- my mom, dad, and teenage son. It still feels weird to say that, ‘teenage’. In so many ways he is still just a boy. His dark-blond hair tousled and his imagination still intact. Although his appetite is one of a teenager. His meat-eating is making up for all the mammals he did not consume the first several years of his life. 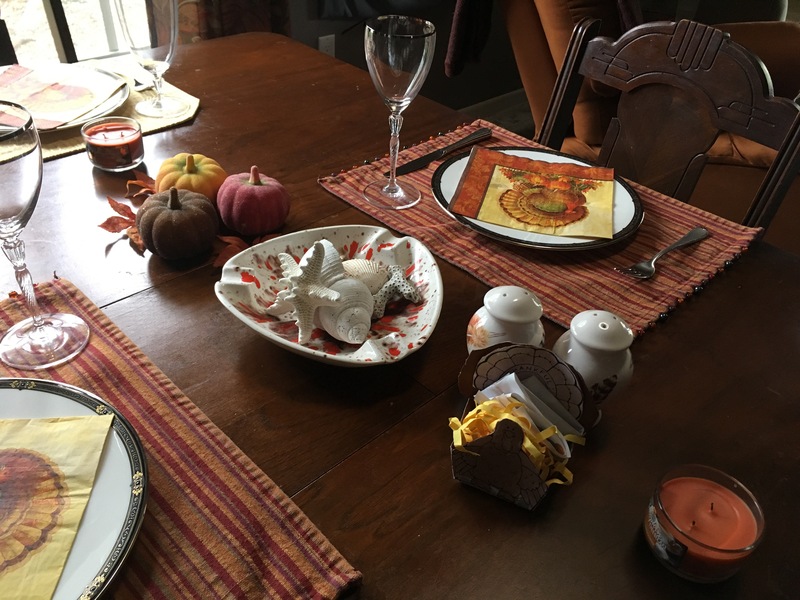 I’d also set the table before my parents arrived, arranging the crystal glasses and beautiful black and silver bone china plates on the brown and gold place-mats. The plates were as flawless as they’d been when they arrived in packages at the doorstep as wedding gifts for me and my soon-to-be husband. He did not ask for any of the china when we separated or officially divorced. I would have shared it with him, of course. It took a year or so afterwards for me to even look at the china. Now I wash and dry them carefully after holiday meals, tracing the raised etchings with my fingers. My mom and I shared a bottle of wine, perfectly chilled and light and brisk, just as I imagine the vines in Washington, from where it came. Back in the small and warmly-lit kitchen our appetizer spread was a gorgeous mingling of banana bread, fine cheeses, fresh fruit, honey, and my mom’s amazing deviled eggs, sprinkled with paprika. We ate and drank and chatted while the teenager napped peacefully on the couch. The main course just an hour from ready to devour. When the yeast rolls were browned and the salad tossed with olive oil and white balsamic vinegar, it was time. We filled our stately plates with an assortment of both mine and my parent’s favorite holiday dishes. The light and crunchy salad paired well with the warm green bean casserole and fluffy potatoes. Tart and sweet cranberry sauce made the perfect coupling with the savory, chicken casserole (we do that instead of the traditional turkey, it is a hundred times better). Baked sweet potatoes sprinkled with cinnamon and a touch of butter is good any time of year. We enjoyed the dinner back at the dining room table, my dad at the head and my son on the other end, my mom across from me. We filled our bellies and mused and laughed. The pumpkin-scented candles flickered on the dark wood. The open window left a cool breeze to gently cascade in as the squirrels played around the big oak tree. Frank Sinatra and the like serenaded through the stereo speakers. No phones buzzing or ringing. The table was cleared and an engaging game of “Heads Up” began. Then we slipped into a family traditional card game of “Oh Heck” which brings out the competitive nature in even me and my mom. I finally won! After all these years! Dessert followed, still on bone china, although these plates smaller and more delicate. Home-made creamy, spiced pumpkin pie from my mom, and Coke-cola chocolate cake made by me and my son. A perfectly sweet ending. There were times when we had sort of a house full on Thanksgiving. Various friends and family over the years and in several different dining rooms or lanais. Although this one not a house full, it felt full in the way it does when company has encased you with good energy and love and you are left smiling and dancing as you clean the remnants of a Thanksgiving feast, intimate. I want to thanksgiving like this! !